This is what a Baird Beer bar should be like, in fact, it’s by far and away my favourite place, in terms of atmosphere, to drink at. While it may be a place that serves Baird Beer, it is not a Baird Beer bar. However, it does share a lot of similarity – prices include tax, there is no table charge, and the whole place is non-smoking too. Some English is spoken and there is English on the menu. The downside to Dragonfly Beer Hall, of course there has to be one, is that the food offerings are pitiful so make sure you do eat before you go along there. Inside the hall – still looks like a warehouse. Dragonfly Beer Hall opened in March 2017 in the Kiyosumi area of Tokyo, literally a stone’s throw from K International School. Not the most obvious place to have a craft beer bar but if you take a look at our map, there is a massive dearth of craft beer bars in the area. The area around the bar is mostly residential and could be viewed as a commuter hub for those working in Tokyo. Getting to Dragonfly Beer Hall is easy – there’s only one station nearby which is Kiyosumi-Shirakawa – but make sure you know what the building looks like. Even though it’s a repurposed warehouse, they’ve kept the outside looking like it one was, with only a dragonfly sign hanging outside. However, when you get closer, it becomes obvious it’s a bar, with the small outside terrace area for drinking full up, and Baird Beer glasses on tables. The inside still looks like the internal structure, with Nagakura-san, the inspiration behind Baird Carpenter’s Mikan Ale, having worked wonders it seems to bring out the old structure, also updating the structure to handle the hot summer months with fans. There is no table charge in Dragonfly Beer Hall and also the whole bar is non-smoking – both outside on the small terrace and also inside. There is space for about 20 to 30 people inside, and the small terrace has space for about 10 people but it also has a small area to park your bicycle too – a nice little idea. Dragonfly Beer Hall only sells Baird Beers – not a bad thing by any means – and they have 9 taps of their beers – eight of these are part of Baird Beer’s all year round range of beers, and one of them is one of Baird’s seasonal beers. 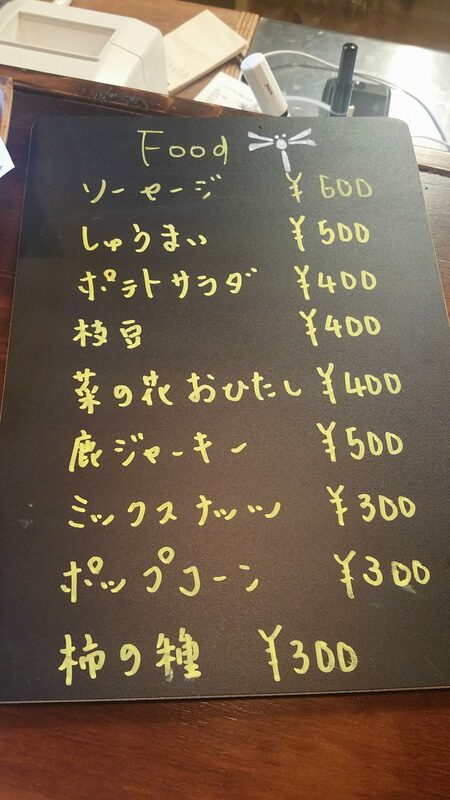 All the beers come in two sizes – ¥1,000 for a 500ml glass and ¥600 for a 250ml glass with all prices including tax. The seasonal beers also follow this, so not a bad deal to get some of them here if they are the big hitters such as Baird Dark Sky Imperial Stout. There isn’t a stamp card though like the other locations, nor is there a happy hour either, and no beer flights. Not the biggest menu the kitchen is tiny. Baird Beer are notorious for opening bars with food themes – Bashamichi has BBQ food, Harajuku has yakitori, Takadanobaba has kushiage, Numazu has fish – Dragonfly Beer Hall has pretty much nothing, besides some small snacky food. Not a bad thing but make sure you eat before you go there, else you may end up hungry and drunk. The closest station to Dragonfly Beer Hall is Kiyosumi-Shirakawa on the Tokyo Metro Hanzōmon Line and the Toei Ōedo Line.